"Rogue Robs Trains" is simple roguelike made in 7 days for 7DRL2019 game jam. 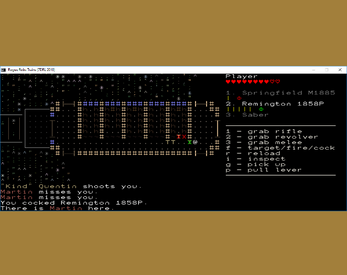 Game is made with use of RAWIG roguelike template (https://github.com/VedVid/RAWIG), and uses BearLibTerminal (display-focused library made by Cfyz) and Deferral-Square font (made by Brian Bruggeman). In "Rogue Robs Trains" player is bandit that boarded train transport of gold. You must kill everyone and stop train. The core of the game is ranged combat mechanics. Two important factors are distance from target (rifles are most efficient on long (>20 tiles) range, revolvers on medium (>10 and <= 20 tiles) range. Windows - download, unpack and run. 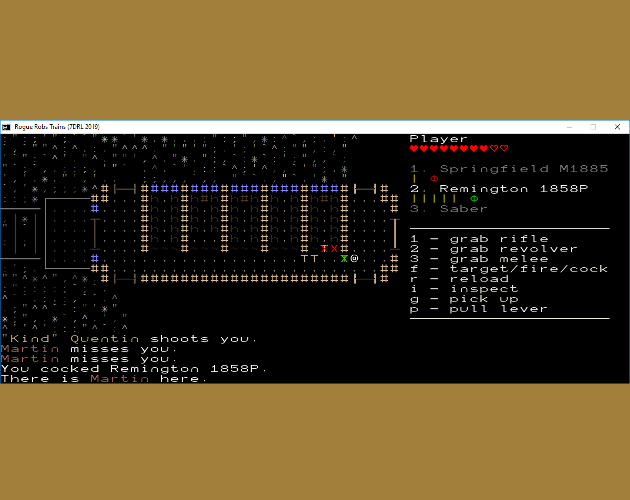 Linux - for 7drl version you may need to, additionally, move BearLibTerminal.so to your libs directory; for post-campo releases, use run.sh to start game. I have just seen a video of this nice game on the channel of ToneHack. This is such an awesome project! It reminds me of DoomRL with the quick gameplay. It's fun to explore the weapons and try to adjust tactics. Well done, I'm excited to look at your other work! Thanks! :) Comparison with DoomRL is huge praise! > I'm excited to look at your other work! My score 418, very nice. Great job on completing the 7DRL! This is very nicely done. The shooting mechanics are cool, almost everything seemed to work as intended for me. I experienced two minor bugs (the animation didn't work for me, and the game window did not want to close, but instead multiplied my score when I tried to quit). Aside from that, though, very good. I'm wondering if you were tempted to make the subsequent cars of the train procedurally generated? Would be cool to have the "special" cars (like the last car or the locomotive) read from JSON files, as you did, but then randomly generate some cars in-between, to make the experience a bit longer. Though I'm not sure if you could manage to finish both pre-made and randomly generated locations before the deadline. I loved the gun variety, but I have to say there is very little motivation to switch guns, since the initial ones you have are good enough for the job. It would be cool to have an actual progression, and force the player to switch guns as they go (I guess this is something you could easily improve post-campo). Because of time pressure, I forgot to include info about some keybindings in readme or in-game - I will fix it in post-campo release. To quit game during run, you need to use <SHIFT>+Q. To save a game - <SHIFT> + S. To close high scores screen, player needs to press <SPACE> or <ENTER> or <ESC>. At first, I'd like to obtain more info about bugs. What version were you playing? What is your OS? How did you try to close window? Are you sure that you turned animations on? It's off by default as it doesn't fit architecture *that* well. Regarding variety and progression, I think from a game design standpoint these two tend to go hand in hand. What I mean is that you may give your player a huge variation in content, but if there is no progression, they will have little motivation to explore it. Even in games with very small scope I think progression is important, since it gives a feeling of direction to the gameplay - if you don't have a progression in difficulty, the gameplay is basically the player character moving from one end of the map to the other. I can't reproduce multiplying score bug, nor see the reason in code. Which screen was affected? With flavour victory/lose text, or with high scores list? I added quitting game by "X" button, but it's going to be some kind of panic button (close immediately, save game) for now - until I'll implement submenu for handling this case. Actually, there is no progression - except starting and final levels, the order of carriages is random. > Actually, there is no progression - except starting and final levels, the order of carriages is random. Ha, I was pretty sure the number of enemies was increasing with each carriage as I went (I was finishing the levels with lower and lower health). Is the number of enemies in each carriage randomised as well? If so, I just had an interesting playthrough then. Ah, I see it now! OK, it will be fixed in next release. Thanks for help! >Is the number of enemies in each carriage randomised as well?